Do you plan on hiking the Quilotoa Loop? The most popular trek in Ecuador should be on every traveler bucket list when visiting the country. Follow our budget guide with hike description and photos where we compiled everything you need to know before you go. Quilotoa Loop is a ring-shaped trail which connects remote villages in the high Andes in Ecuador in Cotopaxi region. 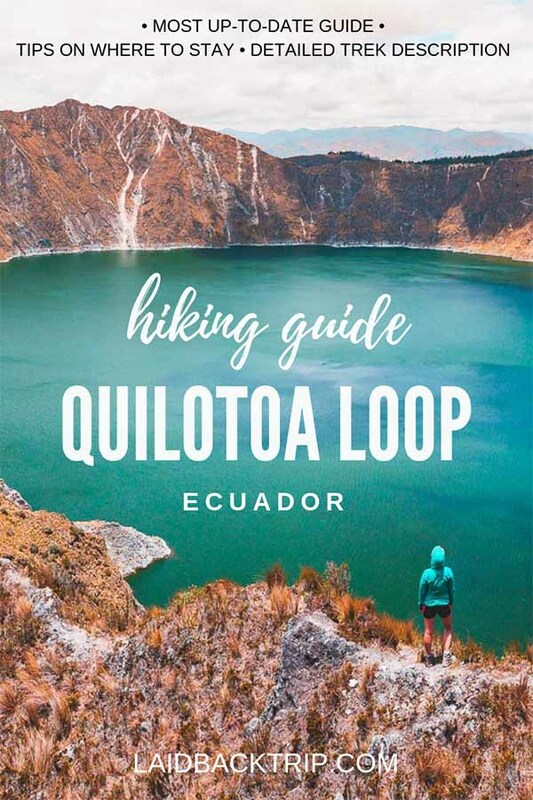 You don't need a guide or porter to hike Quilotoa Loop, but it is necessary to have some instructions before you set off. The loop walks across deep valleys, along dusty paths, around rolling green hills, through small traditional settlements and either starts or finishes at the azure-colored crater lake high up in the mountains which was created around 600 years ago by an enormous eruption. Although you can visit Quilotoa Lake on a one day trip from Latacunga, it's a great adventure to hike the whole loop, especially for those, who are seeking off the beaten paths. Every blog out there says that you will get lost, but you don't need to worry. Firstly, the trail markings improved vastly over the past few years, and secondly, we've put together all information needed to help you with orientation. You will probably appreciate the flexibility, as there is no given place where you need to start the trek, rather the opposite. You can either start in the villages of Sigchos or Isinlivi (it depends how many days you have) and climb your way to Quilotoa, or you can begin at the crater and walk the other direction. This option is less demanding as it goes mostly downhill, the only downside is, that you will see the highlight already on the first day. We preferred to keep the crater for our last day, so in this post, we will describe Quilotoa Loop as we hiked it, from Sigchos to Quilotoa. The whole loop is around 40 km long, and to finish it, it takes anywhere from two to five days, depending on your starting point and walking speed. As per our experience, two nights and three days are sufficient enough. The reason why is this trek so popular is the easy accessibility from the capital of Ecuador, Quito. From Quito, take a bus from the south terminal (Quitumbe) to Latacunga. Buses depart regularly, approximately every 30 minutes. The ride takes about 2 hours and costs $2.30. From Latacunga, you'll need to catch a bus to Sigchos or Isinlivi it depends where you decided to start. The bus goes from the same terminal you arrived at before, and the bus to Sigchos goes at 6:00, 8:00, 9:00 and so on. You can buy a ticket in advance, but it is not necessary (we were probably the only one who ever done it judging by the looks we received at the counter). The ride from Latacunga to Sigchos takes about 2 hours for $2.30, and you will be dropped off at the Sigchos bus station. You can take a bus also to Isinlivi, but it doesn't go that frequently or to Quilotoa. You will most likely spend a night in Latacunga, where you can also leave some of your stuff which you don't want to carry. The most popular hostel in the city is Hostal Cafe Tiana. It has reasonable prices, and although it is not the most beautiful accommodation ever, you can safely store your bags here (bring your padlock). We stayed there a night before the trek, and when we came back, we slept in nicer (and even cheaper) Hostal Latacunga. Yes. A lot has changed, and the trail is now well-signposted, it is usually a work of hostels along the way. Also, hostels will provide you with basic maps and instructions. We would still recommend using maps.me app though. The accommodation along the trail was surprisingly comfortable. Rooms were simply equipped but were clean, shower was hot, and there was also a wifi connection. The room usually comes with dinner and breakfast, and there is an option to buy a packed lunch for the next day. Rates with two meals were in the range from $30 - $40. If you are going to follow the trek the way we did it: Sigchos > Isinlivi > Chugchilan > Quilotoa, you can stay in following hostels. Isinlivi: We stayed in pleasant Hostal Taita Cristobal, or there is another and more popular option with jacuzzi Hostal Llulu Lama. Chugchilan: There are a few reasonable accommodations in this village. We decided on Hostal Cloud Forest, but there are also other excellent lodgings such as Hostal El Vaquero. Quilotoa: The most touristy village of all, because visitors can get here directly by bus from Latacunga. Prices are also a bit higher, and not all hotels include breakfast and dinner in the rate. Try Hostal Chukirawa. You are going to need sturdy hiking boots, backpack (30-40l), rain and windproof jacket and both thin and warm layers of clothes. Take long and short sleeved t-shirt, hiking trousers, shorts, sunscreen, and a hat. Take warm clothes to wear in the hostel, but you won't need a towel and sleeping bag. The weather in the mountains is unpredictable and can change rapidly. Your best bet is to start early in the morning as it is usually sunny without clouds, afternoons are quite often cloudy and rainy. We did the hike in September and were lucky enough not to have rain at all, but it was too hot during the day and quite cold at nights. Also, a cold wind picks up, especially at the Quilotoa Lake. The Quilotoa loop starts in Sigchos (2850m), and descends into the valley, then follows the river, and finally climbs up to Isinlivi (2950m). Next day is about the same the trail descends back into the valley then the path climbs steeply to Chugchilan (3200m). Last day you need to get to Quilotoa crater (3800m), but first, it is necessary to get down to the valley and start the climb from the lower point. The Quilotoa Loop is a budget-friendly hike. Together, we spent $100 for two nights and three days when we count accommodation, food, and transport since we started and then finished in Latacunga. Hiking Quilotoa Loop is considered safe. The only serious issue you might have is dealing with altitude sickness, but the proper acclimatization for example in Quito should be enough. Another inconvenience can be strayed dogs along the road - we met just a few, and we always walk with a wooden stick and couple stones in our pockets. There is also cattle on the pastures. Some bulls did not look particularly friendly, so we tried to walk as far as possible. The first day of the hike is a nice walk which most of the time is flat or goes downhill (with one exception), so take your time, and start with breakfast, or early lunch in one of the local eateries in Sigchos after your arrival from Latacunga. The trail starts from the south-east part of the town. There is also a red and yellow sign showing the right direction. Follow the unpaved road, and go down, pass by the church, and in 200m, the road sharply turns left. You can now leave the road (there is another sign), so follow the sign and take a shortcut. After a few minutes, you will see another sign, which says not to turn right. Listen to the instructions and turn left instead and take a narrow trail steeply heading down into the valley. Once you emerge back on the main road, turn right and go down. Then again, there will be another sharp U-turn, leave the road and take a shortcut. Finally, you will appear at the bottom of the valley, so here join the unpaved road. Turn right and follow the road (on your left side should be a big concrete bridge, don't cross the river yet). Now comes the easy part, as your only task is to stay on the dirt path. In about two kilometers, turn left and leave the road. There is a small farm, sign pointing left and a horse. I'm not sure, the horse will be there when you do the hike, but you can't miss the sign. Walk through some farmlands, along with corn fields, and slowly descend to the river. You will see a concrete bridge, and this time, cross it. Past the bridge, turn right, and in 20m turn left, and climb the short slope. You will emerge on the unpaved road, turn left, and when you get to T-junction, turn right. Follow the road. Here comes the tricky part, and you have two choices on how to continue. If you're using the app maps.me, you will see trail turning left. We took this path, but in the middle of the climb, there was a closed gate with the barbed wire. Fortunately, there was a family, who owns a property, sitting under a tree so we politely asked them if we can carry on because we didn't want to go all the way down. They approved, and the lady even offered us lunch, a nice bowl of soup and eggs. The general rule is, if you see a closed gate, you can go through, but don't forget to close the gate behind you and also watch for dogs. The views of the valley from here are stunning, unfortunately, at the time of our hike, the local farmers were burning their fields to help new plants to come up, and the whole valley was covered in haze, and the air was filled with the smoke. When you get to the top, you will join the main road, turn left and in 30 minutes, you will arrive at your today's destination, Isinlivi. Isinlivi is a small rural village, and there is not much to do. There is a small craft shop where local women will tell you everything about their work and products and a few small shops. We accommodated ourselves in Hostal Taita Cristobal, went to a mirador before sunset and then just waited for dinner and relaxed. When we woke up, the sun was already out, and it looked like it is going to be a beautiful day, the air was clear, and there was no sign of fires. We had granola, yogurt, and fresh fruit for breakfast. Then we got our lunch snacks, quickly packed our stuff and started our hike shortly after. In the hostel, we got the simple paper map with instructions, but good news, the trail is well-signposted, so follow the path and red and yellow signs, and you should be fine. You have two options on how to get to Chugchilan today, and it's only up to you, which one you'll take. One of the trails is shorter, the other is longer, but according to the map and the people in the hostel, more beautiful. After a brief discussion, we chose to hike the longer trail, which should have taken about 5-6 hours. The first part of the trek led us down to the valley where we crossed the concrete bridge and hiked a little bit up, walked through a pasture with bulls (don't get too close), and then turned right (there is a big red and yellow sign). When looking back, you will get a stunning view of the valley, where you hiked yesterday and higher above on the right side you should see the village of Isinlivi. Now the path will take you all the way down the valley, follow signs and trail, at some point, you will walk through farmlands, and then you will see a huge rock wall towering above you. Still, continue down, you need to get to the river, watch for the yellow and red paint on the rocks or trees. The trail here is narrow, steep and unpleasantly dusty, and it might get muddy after rain. Finally, we arrived at the bottom of the valley and crossed the river on a wide wooden log. On the true left side of the river, turn left and join the unpaved road. After about 20 minutes, you will arrive at the intersection with a proper bridge. We decided to eat our lunch here and take a break in the shadow. If you followed the shorter trail, this is the place, where the paths merge into one. Don't cross the bridge, unless you want to get back to Isinlivi and follow the main road. You will start to gain elevation, but it's a pleasant walk except for the dust. There is a house on the right side along the way, where you can buy some refreshments. After you reach a small settlement of Itualo, with several corn fields, few houses, barking dogs and a church, turn right, and you will start your climb and the hardest part of the day. The elevation gain is about 200m, so take your time and enjoy the stunning views of the valley. At this point, we met a girl, who begged for money and candies and hiked all the way up behind us. There were more kids at the top of the hill, and later when we talked to other hikers, they told us the same happened to them. Don't give them any money (anyhow cruel it might sound), as it will encourage them in this behavior. If you want to help, bringing school supplies might be a good idea. There is newly built mirador at the top of the hill with spectacular views of the valley just a short detour from the trail, and you can make a small donation if you've enjoyed the place. Back on the trail, follow the signs and shortly after, you will get the views of the other side of the valley. Continue walking, and you will emerge on the paved road (also newly built), turn left, and it's about 2km walk to Chugchilan. We arrived quite early to Chugchilan, even though we took the longer route and spent the rest of the day relaxing and watching movies in our room in Hostal Cloud Forest (they provided us with a portable heater, which we didn't have to use, as the night wasn't that cold and we had more than enough warm blankets). Later that evening, we had dinner and received a basic paper map (with hiking instructions in English on the reverse side of the map) and brief instructions about the trail, which we were about to hike the next day. The guy from the hostel told us (with help from a fellow hiker who translated) that we can choose between two trails. As usual, the nicer path supposed to be harder, and also there was a short but potentially dangerous landslide area, but it seemed that majority of travelers would take this path and so we have. We woke up early in the morning, and after breakfast, we picked up our lunch, packed our stuff, and set off. The weather was changing fast that morning with clouds and colder winds coming through the valley. Luckily the sun came out, and we decided to wear only shorts and short-sleeved t-shirts. We walked through the quiet village and followed El Vaquero signs, and turned left before the local library. The path led us further down the valley until we reached an important intersection, where the trail splits. We turned left and were going down until we reached the bottom of the valley with a small wooden bridge, which we crossed and immediately started our climb back to the top of the rim. The right trail goes to Quilotoa crater via La Moya village. The climb was fairly steep, but we were still full of energy and made it to the top quickly. The landslide area turned out to be not particularly dangerous it might be a different story after heavy rain though. Finally, at the top, there are two viewpoints. The first one is only a few meters from the place, where you just finished your climb, the other one, is a short (about 200m) walk along the ridgeline and offers one of the best views on the whole Quilotoa Loop. From the viewpoint, we followed the unpaved road all the way to Guayama San Pedro village and turned right after we passed an outdoor playing area and walked straight until we reached another intersection, where we turned left and followed Rosita Hostal signs. After we left the hostel behind us, we took a break and had our packed lunch, bun with cheese and tuna fish, and after we refreshed ourselves, we started our final climb to Quilotoa crater rim. The unpaved road leads directly to the top of the volcano, only follow big green or brown Quilotoa signs, and you can't get lost. The road and the signs are a huge improvement from the past years, and most of the older travel guides and trek information, have outdated information about this part. You will walk and gain elevation quickly, and the only thing that makes the climb unpleasant is ubiquitous wind, dust, and sand. In about an hour, you will reach the rim. The views from the top overlooking Quilotoa Lake are breathtaking. The crater is 3km wide, water-filled and the lake has a greenish color. Once again, you will face two options on how to get to Quilotoa village. The trail which leads to the right is an obvious, shorter and easier choice. But if you have enough time and energy, you can turn left and walk the longer and harder route, in that case, add 3 - 4 hours to your walk. We chose to walk the faster route, as we wanted to get back to Latacunga that day. The trail should be easy to follow from now on, just walk along the rim and watch for the signs. It was extremely windy at the top, and we were hungry, so we decided to find a nice and protected place to eat, which turned out to be a big mistake, as we eventually lost the trail. With a little help from a local shepherd, we eventually found the rim trail again and could carry on to the village. The walk around the crater is an adventure itself, the clouds and sun play a game of shadows on the lake surface, the unforgiving wind pushes you furiously out of the trail, and the sand is everywhere. At last, after almost 6 hours of hiking, we reached the village of Quilotoa, walked through and caught the bus to Latacunga. Are you planning to trek in Ecuador soon and looking for accommodation along the Quilotoa Loop? By clicking and making a reservation via our affiliate link you support us as we will earn a small commission at no additional cost to you, and it helps us keep our blog running.